Luigi Ademollo, an accomplished painter and draftsman, was born in Milan and attended the Academy of Fine Arts of Brera. He left Milan when he was 18 and traveled to Rome and Florence. Ademollo was most known for his masterful frescoes with biblical scenes from the Old and New Testaments. He is also known for his paintings and murals in countless villas, palaces, chapels, and government buildings. In 1789 he was appointed professor at the Academy of Fine Arts in Florence. That same year he was asked to execute the decoration at the Teatro della Pergola in Florence, and later, a large number of sacred and secular decorations in Tuscany. In Florence, he produced frescoes for the Royal Chapel in the Pitti Palace, the chapel of the Annunciation of the Assumption and the Basilica della Santissima Annunziata (Basilica of the Most Holy Annunciation). 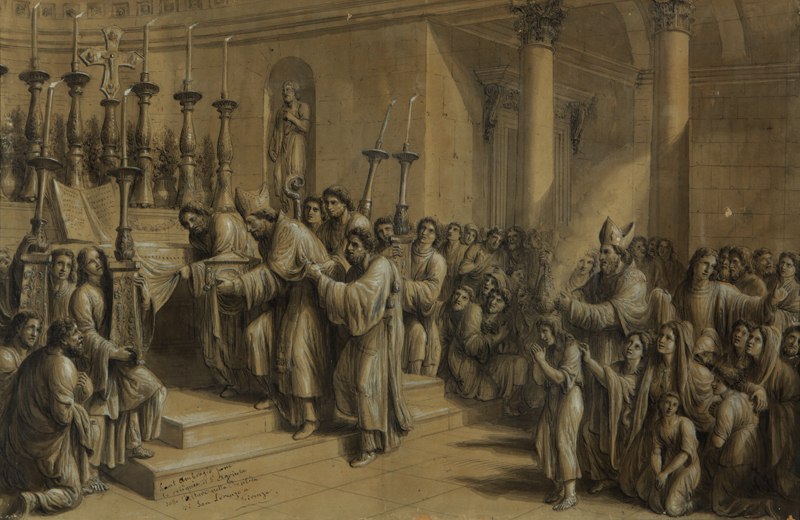 Between 1794 and 1827, with the same astonishing skill, he produced etchings with subjects taken from the Bible, Homeric poems, Torquato Tasso’s Gerusalemme Liberata (Jerusalem Delivered), and Greek and Roman history.He continued to decorate theaters, including theater curtains, until he died in Florence in 1849.